KR Audio is no stranger to us. 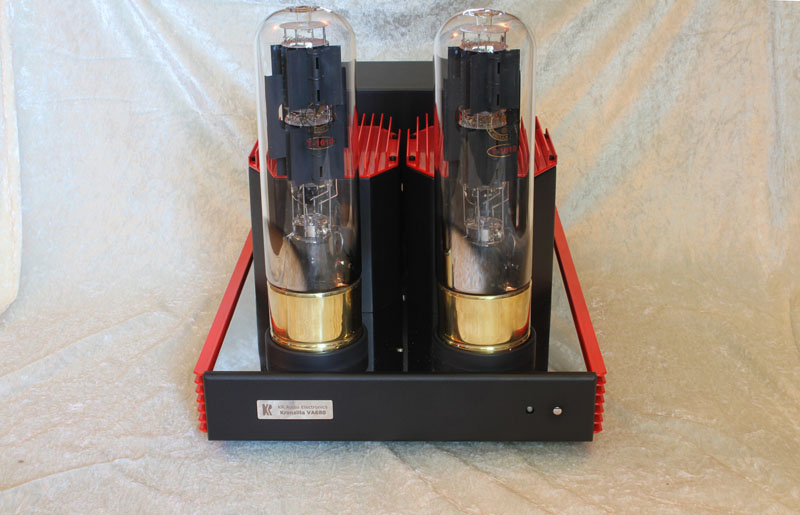 We have already had the honor through its paces different amplifiers of this Czech manufacturer that already more than a quarter century in the limelight. Become maker of special own power tubes to equipment suppliers with a complete private signature. This time, we can get started with a relatively compact amplifier KR Audio, the VA 830. An integrated 300B push pull amplifier. 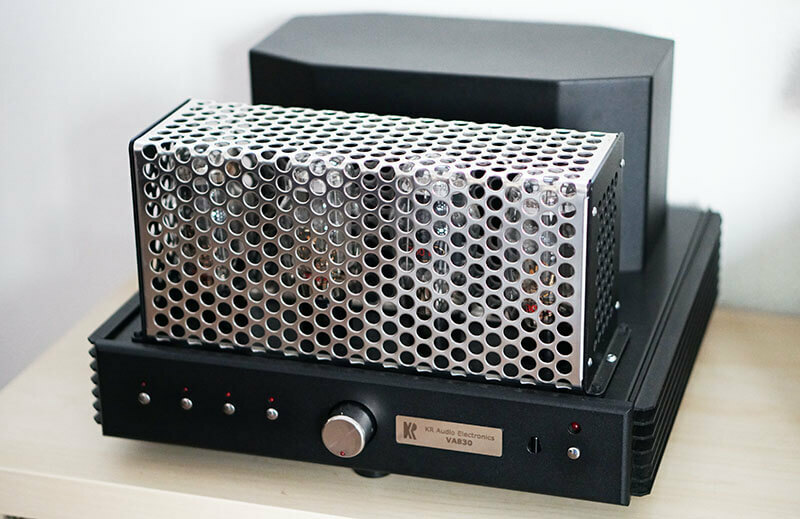 What makes a KR Audio Amplifier special? That is, the ‚inverted hybrid „circuit. With a solid state preamplifier / driver driving a tube amp. 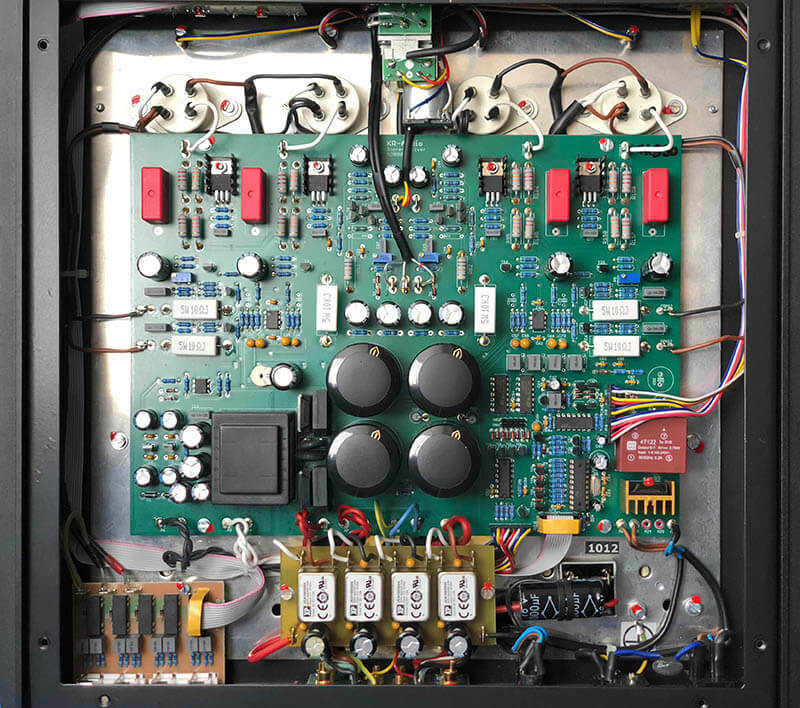 In 99 of the 100 hybrid amplifier circuits, there is a pipe for stairs with power MOSFETs that ensure power to the speakers. 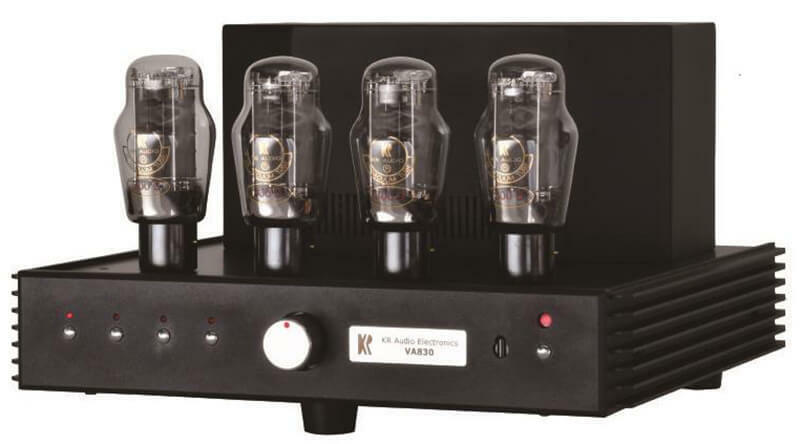 KR Audio has developed a preamplifier circuit that runs on high voltage. A 300 has a voltage swing at the control grid (the entrance of the tube) of, say, 80 volts. Which should, ideally with still a reserve, called „headroom“, supplied by the voltage amplifier. That does not of course with a solid state amplifier circuit at say 25 or 30 volts. 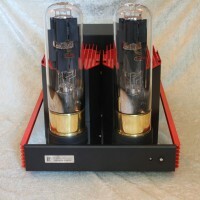 The KR Audio 830 VA power wise a giant amplifier. This time not the 300BXLS tube that can deliver more power than just a regular 300B. Of course its own kitchen pipes. In order to get more power output, so that the amplifier is not fast moody in the choice of the speaker, there are two per channel 300B triodes used in push pull circuit. This brings the output to roughly 4x the output of a single ended switched 300B tube. That seems to contemporary concepts not much, but I can assure you that fill the living room seamlessly with plenty dB with a normal speaker. The VA 830 is a compact device for KR Audio amplifier concepts. Much more manageable than the often above average heavy big brothers. The weight of about 20 kg, making it a lot more manageable. Physically this is undeniably a KR Audio amplifier. The shape of the housing, the transformer and pipe protection caps, according to the now familiar primal sound that industrial-looking sleek design. The front excels in simplicity. Tight and functional. With a push button, choose the desired input. The back side is populated by a four input pairs cinch buses, the four speaker terminals and the IEC mains connection. Hidden behind a cover you can find the choice between 4 and 8 ohm speaker loads. It is not uber critical. Speaker systems are virtually never a pure 4 or 8 Ohm load. The impedance response of an average speaker is the practice of deep valleys to high mountains. If the fall is really deep and dive below 4 ohms, the output transformer then set at 4 ohms. It always strikes me how much better the finish of the KR Audio amplifiers over the years have become the inside. 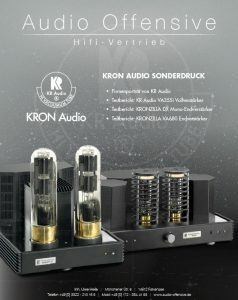 Looked past here and there some downright crummy, contemporary KR Audio amplifiers are beautifully constructed, as is also clearly visible in the pictures. The main PCB contains in addition to said solid state preamplifier / driver stages also an auto bias circuit which adjusts, if necessary, by the tube bias, and holds it in the right setting. There have basically been tuned to be nothing when changing power tubes. And very beautiful: the tube holders are excluded from the PCB for the 300B’s. That makes the durability immediately much better. Seeds should not end on a PCB that KR Audio has understood very well. What more could we see? The power supply for the output stage is buffered with a healthy 4 x 470 uF. The 300B output tubes get their 5 volt filament of four power modules‘ XP Power. This I myself have not seen before in this type of application. No known 5V voltage regulators but integrated module where you between 4.5 and 9 volts DC can stop in which then always 5 volts to the exit. The four inputs are connected with relay near the cinch connector. The power transformer is a firm toroidal transformer, the output is selected for classical blocker transformers. The volume is controlled with the familiar blue Alps many used motor potentiometer. The amplifier comes into my audio rack between digital and analog sources and our own Master Tone loudspeakers. After switching on is how quiet the amplifier, not the least hum mark or murmur can be heard from the speaker. But do listen to music. The amplifier has the required hours behind and leave after some warm-up time immediately previous experience with KR Audio Amplifier clean but hear powerful sound. Nothing indicates that playing is a „small“ amp here. Very beautiful … The user need not be limited to small-scale music. Solid rock also does not flinch at the KR Audio VA 830. I have long sleepover that the amplifier has here may bring really just enjoyed the quality that always sounds again this KR Audio. I also suspect that this amplifier considering the low-stress effect and not excessive heat in the body can last a long life. The largest service station is‘ m here in the four output tubes. One issue every few years, depending on the number of hours, a new set of punch and play. The bias is automatically adjusted to the correct value. 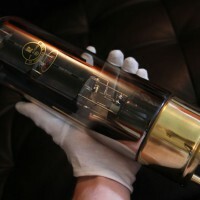 Many 300B amplifiers are single ended. Also found in the stable of KR Audio are several SE amplifier. Precisely the preeminent 300B there is indeed suitable for and can sound wonderfully beautiful. However, two notable disadvantages: At lower frequencies, the transformer distortion, play by the saturation of the transformer core. A Single ended output transformer in the amplifier must also process the continuous one-sided DC current in addition to the normal alternating current signal (music signal). Previously applied an air gap in the core, otherwise it would become the core equal in saturation and is then impossible to do his job. The refiner gap in this case, however, extends to a lower inductance of the transformer. In order then still to be able to is the core of a single ended amplifier quite a bit larger than in a push pull amplifier, wherein the reverse bias currents cancel each other out to a low frequency range distortion characteristics. In a push pull amplifier, however, occurred that no or at least much less quickly, or there is a backward small core in the output transformer needs to be used. The missing air gap in the core of a push pull output transformer and the associated much higher inductance of the primary windings has in addition to a more appealing cost image as a great advantage that a push-pull-connected tube amplifier is significantly less effort with a deep continuous layer viewing. Which switching principle sounds best? Let me put it this way: I personally prefer a well-made push-pull amplifier moderate invented single ended. 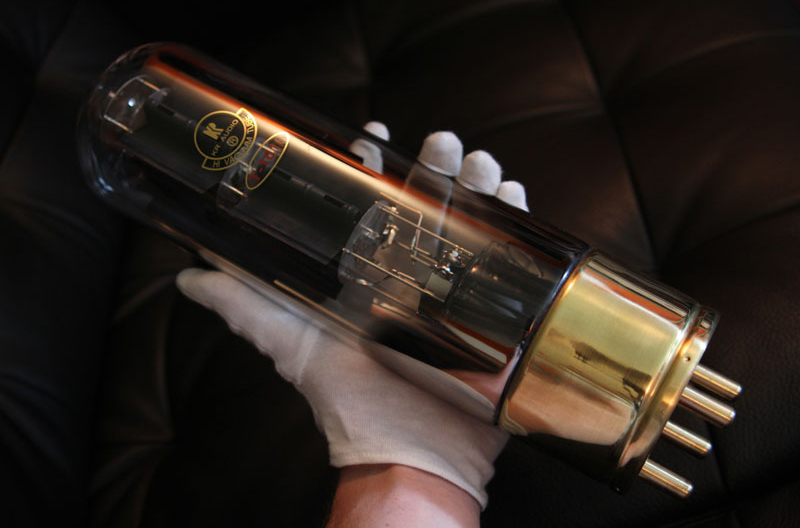 A well -made single-ended amplifier can sound no less than magic used in the correct format. Both principles are simply switching build beautiful amplifiers. The measurement of an inverted hybrid actually shows mainly the distortion caused by seeing the final tube. The driver distortion is lower than with a tube driver. As often with baking pipe, the output indicated by the manufacturer (40 watts) to flourishing promised. How they always fix? With sun and wind in the back of the mountain? In my practice I reach 25 watts into 8 ohms and 29 watts into 4 ohms, from the same transformatortap. A perfectly usable output, nothing wrong. In order to get the full capacity is 725 mV needed. THD + N is an amplifier if it is very low. I measure only 0.089% distortion at 1 watt into 8 ohms. In the target and you see that the level of distortion is largely determined by the second harmoniche here at -62 dB. The third harmonic is a very neat piece later to -78 dB. Interestingly, for a push-pull scheme. It would rather make the spectrum of a single-ended amplifier suspect. The input resistance is a healthy 100 kilohms. The frequency response measurement shows the -3 dB point seen in the high around 35 kHz. The reasonable damped transformer resonant frequency we find around 65 kHz. 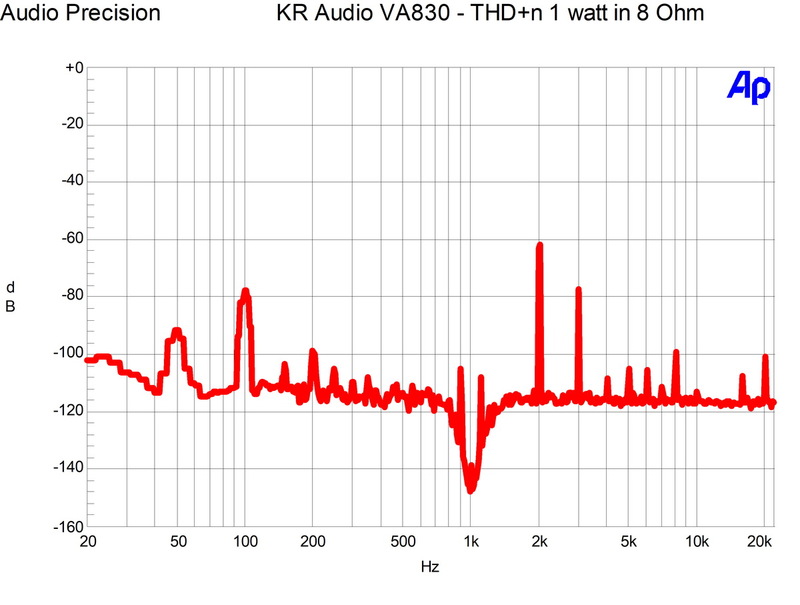 The KR Audio VA 830 also shows the measurement bench beautiful results. 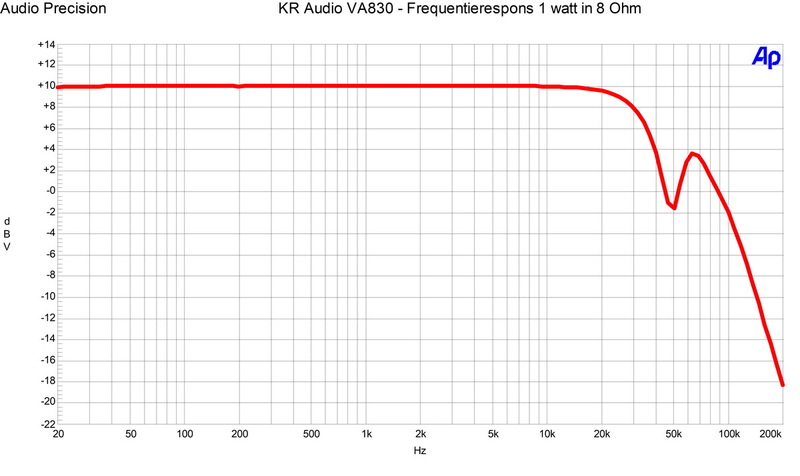 Not too difficult conclusion now: even the KR Audio VA 830 appears to be a heck of an amplifier again. Nice quirky and extremely sturdy construction. And nicely finished in house design of KR. The bling factor is important, looking on. Are you looking for the sweet 300B character, look even further. 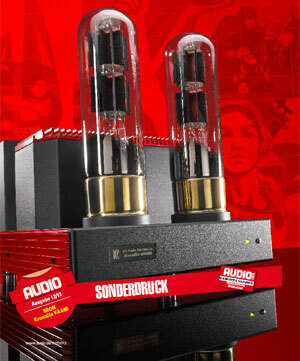 Do you want an accurate amplifier with great display fine qualities, with exactly the whiff triodekarakter, this may be your amplifier. Provide the proper environment and the amplifier can really excel. In spite of that there are tubes 300B are used, they are the push-pull scheme still thanks to a practical output power available. 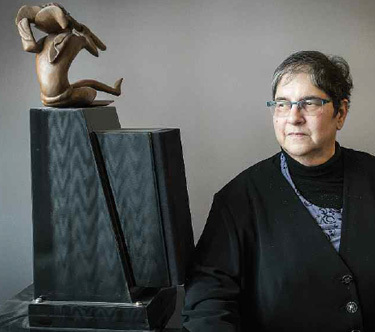 What makes easier the choice of speakers. Wir zeigen euch die neuen KR Audio Referenz Monoblöcke VA 200! Unsere aktueller KRON-AUDIO Sonderdruck zum download. messtechnisch perfekten als auch herrlichst klingenden Endverstärker bauen kann.